Though he quickly points to Jeff Blake as the marquee member of the East Carolina quarterback continuum, Leander Green likes to think that maybe, somewhere on that growing list of quality signal callers, there is a spot for himself. 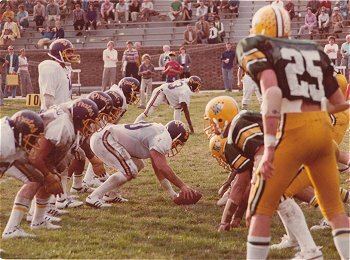 For many who watched Green direct Pat Dye’s Wishbone offense from 1977-79, there is no question that the smallish speedster from Down East belongs among what has become a legendary line of QBs at ECU. It was clearly a different era in the landscape of college football, but at ECU, the era that featured a prolific running attack is highlighted clearly in contrast to the complex passing game the offense has emphasized for more than a decade. Dye’s requirements at quarterback were simple. In practical terms, though, it was quite hard to find a guy who could do it well. The Wishbone was predicated on speed of foot and of mind. And the triggerman had to be able to make multiple reads in split seconds while never allowing his eyes to give away what his mind was processing. In Green, Dye found another Mike Weaver… except with exceptional speed. And Dye found him by seeing what others didn’t see. 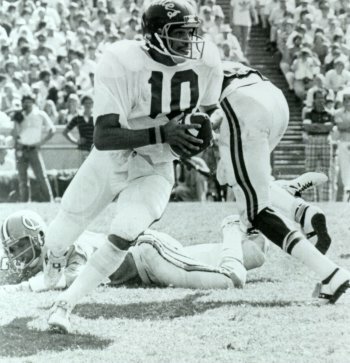 After Pirates linebacker coach Frank Orkle saw Green play at Jacksonville, he told Dye that they had a quarterback prospect. Green had to rely on his gut instincts during the recruiting process. His biggest source of football support, his father Lander, passed away late in his high school career, and his mother, Agnes, wasn’t very vocal in weighing in on his decision on where to go — though later she would admit she wanted her son closer to home. Green’s decision was made more obvious at practice for the Shrine Bowl and the East-West All-Star games. He and Jacksonville teammate Billy Ray Washington (Split End at ECU from 1977-79) were close friends and wanted to go to the same school. At the practices, the two met a bunch of players from around the state that just clicked. The group then conspired. More importantly to Green during preparations for the East-West all-star game, were some words from his future coach. On the East roster along with Green was another quarterback and ECU-signee Tony Tripp. Tripp was a standout from Havelock High School for legendary coach Frank Ciamillo. That year, Ciamillo was the coach for the East team in the all-star game and he played his quarterback for most of the game, leaving Green to be mostly an observer on the sideline. Green’s official visit to ECU only furthered his belief that he was heading in the right direction. Of course to be a big part of something big, requires that a player start as a little part. Though he showed many glimpses early on of the quarterback that he became while at ECU, Green is the first to point out that he had a long way to go before he ever felt like he was good. Though he had hoped to get some playing time as a freshman, after watching his predecessor, he knew it wouldn’t be at quarterback that year. It would be his sophomore year before he got the chance. The team was 8-3 using the dual quarterback system, and then, his junior season, Green took over full-time, leading the Pirates to records of 9-3 and 7-3-1 respectively. Looking back, Green admits that he evolved a lot over time. Green, of course, attributes the success to those around him. Green's appreciation for his offensive teammates is evident, but it pales in comparison to how he sounds when he recalls some of the guys on the other side of the Pirate line of scrimmage. “Zack Valentine,” he recalled. “I don’t think I ever saw anyone ever beat him in practice. His technique was so good, he just didn’t get beat. 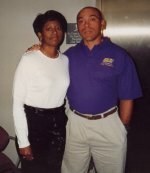 And the other end, Fred Chavis… he was not real big, in fact sometimes he played defensive back, but he could run like crazy. Gerald Hall was a super quick defensive back and as good a punt returner as I have ever seen. And Doug Smith… I have had rarely had a player wow me like Doug. We used to call him ‘Bam-Bam’ because this guy was a bad dude. He was big, fast, strong and when he came in his freshman year, he was obviously something special. Green, though by nature unassuming, deserves the recognition he gets from the ECU faithful. He made the Wishbone look easy, with the fluidness of water… fast moving water, of course. “It is a difficult position to play,” he said. “Once the snap comes, your mechanics need to be good. You have to force yourself to stay on the line (of scrimmage) and not drift into the backfield. You have to ride the fullback and you can’t look at him, you have to feel him back there. And when I say ride him, it really is a ride because my eyes are fixed on the (defensive) tackle, linebacker, or end depending on what the alignment is. There are multiple reads on every play and it all happens very quickly. Oh yes… Green made it look easy and in the Dye era, the Pirates rolled to a 48-18-1 mark with the smallish quarterback from Jacksonville orchestrating 24 of those victories. Dye made good on his promise to give Green a shot at the position and Green delivered. Though his mechanics and speed were clearly visible, it was the intangibles of being a Pirate that made the difference for Green. “Coach Dye ingrained in us, that sense that we were all outcasts of some sort,” Green said. “He used to call us the skinny-legged guys that nobody else wanted. We were the mediocre guys that turned out to be pretty good football players. We weren’t Carolina or State, we were just little ol’ East Carolina… but you didn’t want to play us. Green takes great satisfaction when he sees the Pirates as a program today. 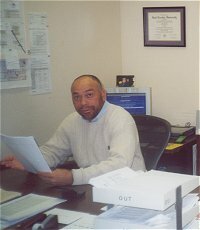 Green left East Carolina and went into a career at Carolina Telephone, where he has remained for 20-plus years. He has worked through all of the buyouts and mergers that have him now as a manager at Sprint. Green is married, to Denise. He has no children and he spends his free time like many former athletes, on the links, where he is working down his handicap — which is a respectable 6, for the record. If he has any regrets, it is only that he didn’t give the NFL a shot. Otherwise, he is happy at home in North Carolina. He will always wonder, ‘what if,’ but it doesn’t dominate Green’s being. And he gets his competitive kick golfing. ECU has remained important to Green, but like many football players, his deepest connections are really not memories of being on the field. And he is really not a good watcher of football these days. 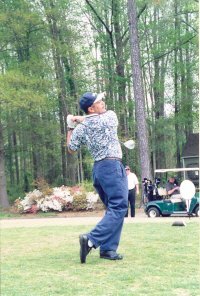 Though he is not a big watcher of the games, he is completely hooked into his memories of ECU, the campus, the people, and his teammates. And his favorite golf partners are his long-lasting friends from ECU. The "12" crew (L-R): McLaurin, Green, Sutton, Holley, Freer. Green cannot put a fix on where he believes he belongs in ECU quarterback lore, but in hindsight he hopes his is a name fans will remember when they reflect on the Pirates' long line of prolific signal callers. For a quarterback that finds it rare to be wowed by others, Green certainly ‘wowed’ those who watched him produce for the Pirates. And, in doing so, his era under center certainly established one of the milestone markers on the ECU quarterback spectrum. Green was a winner in many ways, but most importantly in terms of his legacy, he was a pure winner on the Pirate football field. “The hangout was in the block in the middle of campus. That is where we all hung out. Fred Chavis (defensive end) was the comedian of the team and he kept us cracking up pretty good in between classes."